It’s that time of year again. The 31st Annual Beach to Bay Relay Marathon is just around the corner and it will be my 2nd year participating in the event. I’m so stoked! The team consists of me along with 5 other women, appropriately named the “Happy Hour Honeys.” We will be running the 26.2 mile event on May 20th, 2006. I have set a goal to run my leg, which is approximately 4.4 miles, in 33 minutes or better. Last year I ran it just under 35 minutes. Not too bad after having my 2nd child just 7 weeks before the race. As I started to think about the upcoming race it crossed my mind that we all have goals that we work hard to meet, and often times, we exceed these goals in the workplace. But I think it’s just as important to set goals outside the workplace as well. For me, setting personal goals such as running races, for example, motivate me to strive to do my best in all facets of my life. 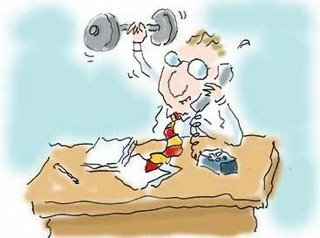 And did you know there is evidence that daily exercise may boost performance on the job? What are your goals for the next week, month, or year? Good post, Amanda. Perfect timing too seeing how we're in the process of setting our Q2 Blue Chip Goals!